Berrio answered questions from GR managing editor C. J. Bartunek via email in January 2019. C. J. Bartunek (CJB): Several other texts about your work reference folklore and literature as among your inspirations. Who are some authors you enjoy? Would you share a tale or myth or a poem that you love? María Berrio (MB): I am deeply influenced by surrealism and magical realism, so some of my favorite classic South American authors are Borges, Neruda, and Márquez. But much of my work has, of late, been influenced by oral traditions, as well as the rituals, customs, and beliefs of South America. For example, a tale I explored in my 2017 piece Aluna references the creator figure and “Great Mother” of the Kogi people from my native Colombia. The Kogi live in the Sierra Nevada de Santa Maria, a remote mountain area. They have lived there in relative isolation since they fled the invading Spanish, and were mostly free from the horrors of the colonial power. Aluna is the mind of nature, the source of all life and intelligence, a living, self-aware force. Traditionally, the Kogi raise their chosen priesthood caste, called mamas, in a cave completely secluded from the outside world for the first years of their lives. During this dark time, the mamas come in touch with Aluna. After nine years of gestation, paralleling the nine months inside a mother’s womb, the mama is brought out to see the sunrise, to go from hearing descriptions of birds to seeing them in all their splendor. The mama finally experiences Aluna in all of her glory. The painting depicts a female version of the mama priest in the moments just after she is brought out of the cave. Her senses are flooded with the intense beauty of the world she is charged with protecting. It is a fragile world, but she accepts her destiny. CJB: Please take us through your process of creating one of your compositions—conception, materials, evolution, and whatever else you might choose to mention. MB: I start each collage with a sketch, which inevitably changes while I’m actually making the piece. I source materials from many different places and craft traditions. I use handmade and machine-made paper produced almost exclusively in countries of the global south: Nepal, India, Korea, Japan, Thailand, Mexico, and Brazil. I gravitate toward paper with natural motifs such as floral, plant, and animal patterns, as well as solid colors that evoke the sky and sea. An individual work usually starts out very abstract, and then I build it up layer by layer, resulting in hundreds of layers of paper that are all woven together into one coherent piece. The work is thus informed by every bit of material layered in it, and by every place the materials hail from. This process of fusing cultural production from a wide range of places is inherent to the form and, more importantly, to the meaning. CJB: From your CV, it looks as though you knew at least by the time you started college that you wanted to pursue a career in art. How did you develop that interest? Who encouraged you as a young artist? What were some pivotal moments in the evolution of your craft? MB: I spent much of my youth in Colombia on my family’s farm. There, surrounded by animals and plant life, my siblings and I didn’t have the same restrictions and rules of life in the city. We were given free rein in nature, and among the trees my imagination was free to roam. The manner by which I expressed this freedom was largely through drawing, which I did constantly. I found that it fed and soothed me. It released frustrations and anxieties, and brought intense pleasure and satisfaction. When I came to New York at eighteen to attend Parsons, I was intent on becoming an artist. I immersed myself in drawing. I filled up entire sketchbooks just observing the world around me. I learned how to tell stories by drawing the everyday, and then making it strange and infusing it with magic. I had the most incredible teachers and mentors there, not only for drawing but also for printmaking. I enrolled for graduate work at the School of Visual Arts right after Parsons so I could continue to hone my skills. During my MFA, I was really able to develop my own voice and technique. A pivotal moment was when I discovered handmade Japanese paper. I had been drawing patterns inspired by wallpaper and fabric samples when I discovered that paper and began to collage with it. There’s such a wide range of patterns and textures within the Japanese craft tradition alone, and since then I’ve expanded to paper from other locations. It was challenging in the beginning to work in such a different medium, to contend with all of the possibilities and adopt a new way of thinking. With each series, my goal is to discover even more possibilities and more solutions to the technique. I want to push the technique to its limits. CJB: Are there certain artists who most influenced your technique or aesthetics? MB: While I was growing up in Colombia, the national artists who received the most attention were men. In the 1990s, Alejandro Obregón and Fernando Botero were the only artists I could model myself after. Once I moved to New York, my eyes were opened to the work of women artists. I experienced femininity and womanhood in art for the first time and fell in love. I went to the Kiki Smith retrospective at the Whitney [2006–7] and was so inspired by how she depicts nature and the female body in her work. Her large-scale drawings were also highly influential: the way she glues large sheets of paper together helped me work out some of my own collage techniques. I also saw the Louise Bourgeois retrospective at the Guggenheim  and was moved by the Cells, the series of architectural environments Bourgeois made in the last two decades of her life, before her death in 2010. The Cells transform everyday domestic scenes into strange, emotionally charged dramas. I’m inspired by her ability to abstract and complicate the feminine experience. I am also deeply influenced by the work of Leonora Carrington and Remedios Varos, women artists affiliated with the surrealist movement. Both Carrington and Varos fled Europe during World War II. They met and became friends in Mexico, where they discovered ways to subvert dominant male surrealist tropes. Carrington created powerful depictions of women in dialogue with animals, tapping into mythology and psychology to render an imaginary world in which all beings live in perfect harmony. Varos’s work also draws on a wide range of influences, from esotericism and dreams to alchemy and religion. She dealt with the interconnectedness of the universe; in her works there is fluidity between person and thing, between human and animal. Her painting Celestial Pablum (1958) was of importance to me as I developed Syzygy (2017), a work in which a woman transforms into a bird, enduring the pain of transformation for the promise of redemption. Of course, I continue to learn as much as I can. We are experiencing a moment of remediation, during which scholars are actively trying to shed light on the women artists who have wrongfully been ignored. The recent exhibition Radical Women: Latin American Art, 1960–1985 at the Brooklyn Museum taught me so much about my fellow Latin American women artists. 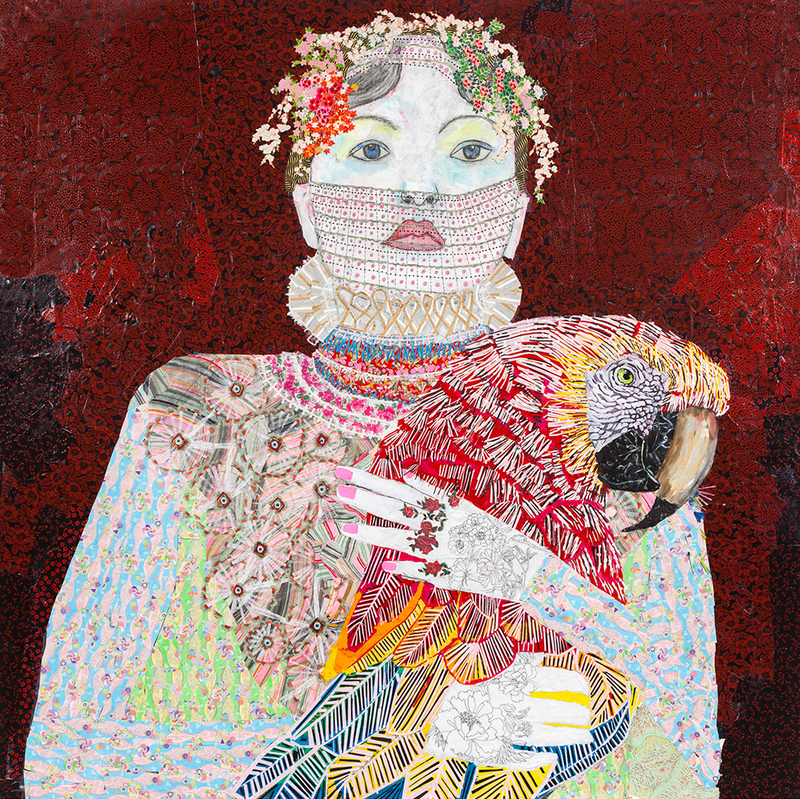 I also find inspiration from more contemporary artists like Rina Banerjee, Ebony Patterson, and Toyin Ojih Odutola. Luckily, the next generation of artists will have more women role models than I had when I was growing up. CJB: A 2018 feature on the arts website It’s Nice That quotes you as saying, “I feel a responsibility too to my community—both Latin Americans and artists. I would like for my paintings to reveal that being Latina is more than being an issue over immigration, that there is a prism of culture and humanity that is often glossed over, if not neglected completely.” Could you elaborate further on what you wish others better understood about this culture? What are some ways these values are reflected in your work? MB: Yes, I was referring to the dominant narrative about Latinos in the United States, which is, as we all know, a xenophobic and racist scare-mongering tactic. This desire to reduce an entire group of people down to the issue of undocumented immigration or drug-related crime is dangerous because it denies millions of people their humanity. There is so much cultural and ecological diversity within the Spanish-speaking world. The sensationalized stories that make it into the news will never be nuanced or complex enough to capture it. In mountains and deserts, in jungles and the steppes of Patagonia, you can find thriving indigenous groups, rural communities, and cosmopolitan cities. Latin America’s complicated history has led to the mixing of so many different peoples, and the vast array of traditions, rituals, and food reflects the beauty of humanity coming together. We are not just one thing, we are a prism of culture. My work celebrates this diversity—not explicitly, but with fantasy—in an attempt to create a narrative that is as complicated and elusive as reality. CJB: I imagine there are aspects of Colombian culture or history informing your work that not all U.S. audiences would easily recognize. Do you still regularly spend time in Colombia? MB: Who I am (my memories, my beliefs, my outlook) is intrinsically tied to time and place. So there are definitely Colombian religions, superstitions, and ways of thinking that find their way into my work. These alternative forms of knowledge are practiced by people seeking order, meaning, and hope. Regardless of how “unreasoned” these beliefs may be according to Western science, I appreciate them as deeply human attempts to understand life and create its meaning. My grandmother, for example, was a staunch Catholic, and the mystical symbolism of her religion bled into all areas of her life. I remember a huge painting of Jesus dying on the cross in her living room, as big as some of my largest canvases. She used all kinds of vivid symbols to teach me many things beyond religion as well. Exposure to this kind of thinking gave me liberty to use symbols and tell stories in my work. The people in my collages embody a fusion of the many rituals, practices, and origin myths I grew up around, in addition to the ones I come across in my research. CJB: The motif of birds, especially parrots, figures in several of the works featured in your Georgia Review portfolio. Could you say more here about their significance? MB: Birds have been a source of inspiration to people across the world for centuries. To me, birds symbolize freedom of the soul and transcendence of the earthly human form. Parrots in particular are special to me because my grandfather had a pet parrot who was his lifetime companion. I’m currently working on a new piece which prominently features a wild whirl of multicolored birds taking flight, journeying together out of their present circumstance and into another. The flock is an impossible mingling of diverse species, each of which carries symbolic resonance in different parts of the world. The dove is a sign of peace in Judeo-Christianity; the hummingbird is a sign of good luck in Latin America; the eagle was thought to bring messages in Ancient Rome; the parrot was worshipped by the Maya. In my collage, all of these beautiful traditions come together to provide a global portrait of hope. CJB: Animals more generally are central to your work; do you have animals in your life now? MB: I don’t have any animals, though in the future I would love to have a small farm outside of New York City. CJB: Among the pleasures of viewing your collages are the characters’ fabulous garments. Could you say a bit about how you view clothing and fashion? MB: The women who inhabit my paintings are embodied ideals of femininity. The ghostly pallor of their skin suggests an otherworldliness; they appear to be more spirit than flesh. These are the women I want to be: strong, vulnerable, compassionate, courageous, and in harmony with themselves and nature. They combine the elements of women who are typically thought of as powerful—the captains of industry, resolute politicians, fiery activists—with the traits of those who are not usually thought of as such, thereby underlining the common force found in all women. The female soldier fighting on the front lines is of interest, but so too is the mother who finds a way to feed her children and sing them to sleep amid bombing campaigns and in the ruins of cities. To truly ennoble womanhood, we must discover and appreciate the beauty in every action, big or small. The costumes are a way for me to bring these idealized images of women into reality. As I mentioned earlier, my interest in collage grew out of my early days drawing patterns from wallpaper and fabric samples. The patterns I see in clothing inspire the patterns I use in my work. I get ideas from the Costume Institute at the Met, contemporary designers, and ballet costumes. Some of the garments in my collages are invented, some are garments I actually own. Everything you see is something I would wear in real life. CJB: I understand that you are developing a public installation for MTA in New York. What has that experience been like? How is that process similar to or different from your other recent work? MB: I designed a subway stop on the N train in Brooklyn that is being translated into mosaic, an art form that replicates and sometimes expands upon my collage technique really well. There will be fourteen large-scale mosaics in a variety of media such as glass, ceramic, and enamel. It’s been great to work alongside the extremely talented fabricators at Mosaika. I usually work by myself, so this opportunity to collaborate with the fabricators has been refreshing. I hope for more opportunities to collaborate in the future. CJB: If you were an interviewer, what is a question you would ask yourself? How would you respond? MB: I would ask “What motivates you to make art?” because I try to remind myself every day why I do what I do. Being an artist can be really challenging sometimes, and it’s always hard to make yourself vulnerable in your work. But the truth is that I have to do it; it doesn’t feel like a choice but a necessity. When I remind myself of this essential truth, I let it all go. I forget about the pressures of the art world, of people’s expectations about what I should or shouldn’t be doing, thinking, feeling, or trying to say. I don’t think about the end result, I just do it because the act of making art feels absolutely right.